His job was to wave to tourists passing by on US Highways 40 and 50, later Interstate 80. Wendover Will took part of his name from the town of Wendover. He was decked out like most cowboys of the time - a white hat (he was one of the good guys), a yellow bandana, a red shirt with a Bull Durham tobacco tag hanging from the pocket, Levi's, cowboy boots, a cigarette dangling from his mouth, and a six-gun around his waist. Will stood in front of the Stateline Hotel and Casino, never taking a day off from 1952 until he lost his job a few years ago. Millions of travelers were welcomed to "Where the West Begins." It was okay if they didn't stop, he waved anyway. Most, though, after a long drive over the Salt Flats or an even longer drive over the high deserts of Nevada, were ready to stop and have a cold drink, fill the car with gasoline, and maybe drop a few coins in the casino slot machines. Wendover Will is on the right side. Courtesy of the Northeastern Nevada Museum, Elko. 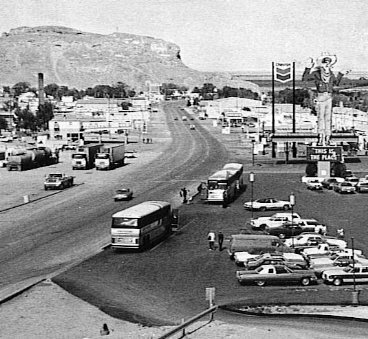 His second name, Will, came from the founder of the Stateline Hotel and Casino, William "Bill" Smith, who started his business on the Utah/Nevada Border in 1926. When gambling became legal in Nevada in 1931, Smith expanded his service station adding a casino and hotel. For a long time there was a white line across the floor. One could eat on the Utah side and step over the line and gamble in Nevada. Wendover Will was so well known that when West Wendover was incorporated in 1991, he was included on the city seal. Many of you have seen Will and know that he is a sign 63 feet tall. His arms were powered by a single 3/4 horsepower electric motor and he was lit with 1,184 feet of neon tubing. He made the Guinness Book of Records as the World's Largest Mechanical Cowboy. Will was made by the Young Electric Sign Company of Salt Lake City. A smaller version, Vegas Vic, was made for Las Vegas. 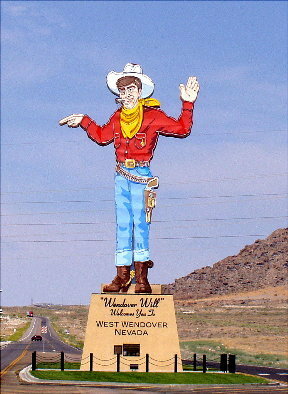 When Stateline became the Wendover Nugget Hotel and Casino, they didn't need poor Will but he wasn't junked. The Nugget gave Will to the City of West Wendover and he now stands in what will be the center of town in a few years as the community continues to grow. The city gave him a big ribbon cutting ceremony on June 9, 2005. You can find him out on Wendover Boulevard west of the gambling area. You can't miss him. After all, he is very tall. Sources: City of West Wendover publicity material for Wendover Will's ribbon cutting ceremony; and the author's personal knowledge.Present day photograph of Wendover Will by the author, July 21, 2006.